If you’ve actually tried to deploy a professional IOS and/or Android app using Delphi XE5 Firemonkey you’ll know how difficult it is to create all of the necessary icon and splash screen files needed. I originally used Adobe Flash to build my own icon sizes but even with all my template files it still took me an hour to export and set all of the necessary icon files for a new app. Along comes this utility which looks like it will make that process a lot easier. 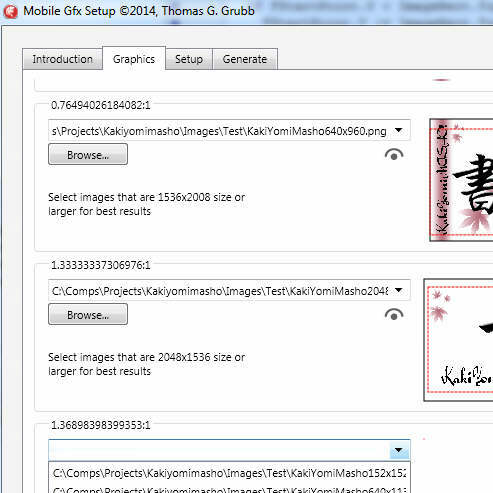 The Mobile Gfx Setup utility is by Thomas G. Grubb from RiverSoftAVG. Basically it lets you use just one image file which it will crop based on the setting that you set for each icon ratio. Generate the 30 necessary icons files with one click and then output the whole thing as a .optset file which is the file type that the Delphi XE5 IDE for Firemonkey can load into your project. The utility is currently free. Head over and download the free icon generator utility.